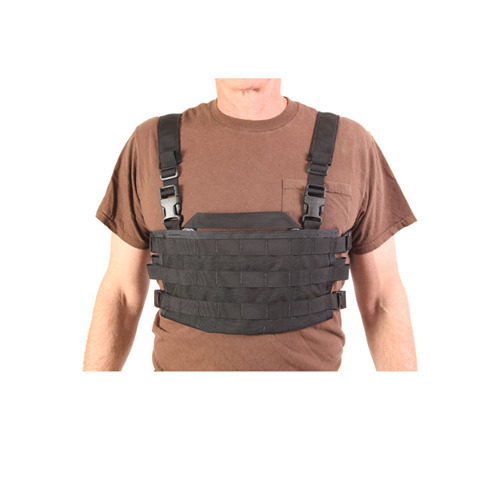 The AO Chest Rig is feature rich and low cost! The front panel was efficiently constructed to provide three rows and eight columns of PALS. The panel has side openings to store paperwork or maps. This rig also features a Velcro hook panel on the back side for easy integration onto many plate carrier systems. A carry handle is sewn into the top to allow quick transport if you have to grab and go. The HSGI Small H-Harness is included with the Chest Rig. This allows the weight to be distributed evenly, and creates a level of comfort over and above the X-backed shoulder straps found on most small chest rigs. Add 3 TACO Magazine Pouches and a Bleeder/Blowout Pouch and you have the perfect setup.